This basic meatloaf is made with a simple barbecue sauce mixture and bread crumbs. Fresh bread crumbs are used in the meatloaf, and they can be from French bread, plain sliced bread, or sourdough. Process the bread in the food processor to make somewhat fine crumbs. Most of the barbecue sauce goes into the ground beef filling and the rest is reserved for the topping. Line a 9x13x2-inch baking pan or rimmed jelly roll pan with foil and lightly grease the foil. In a bowl, combine the ketchup, Worcestershire sauce, and brown sugar; stir until well blended. Take about 1/4 cup of the sauce mixture and pour it into another bowl. Cover and refrigerate until you're ready to add topping to the meatloaf. Mix the remaining sauce with the finely chopped onion, ground beef and pork or sausage, bread crumbs, eggs, parsley, and salt and pepper. Turn the meat mixture out onto the prepared baking pan and shape into an oblong loaf. Bake for 1 hour and 15 minutes. Spread the reserved sauce mixture over the top of the meatloaf. Bake the meatloaf for 15 minutes longer. If you would like to test the temperature, the minimum safe temperature for ground meat is 160 F. For ground poultry it is 165 F. Insert a reliable instant-read thermometer into the center of the loaf. It will probably test higher than the minimum. Ground round, which is about 90 percent lean, is a good choice for meatloaf. 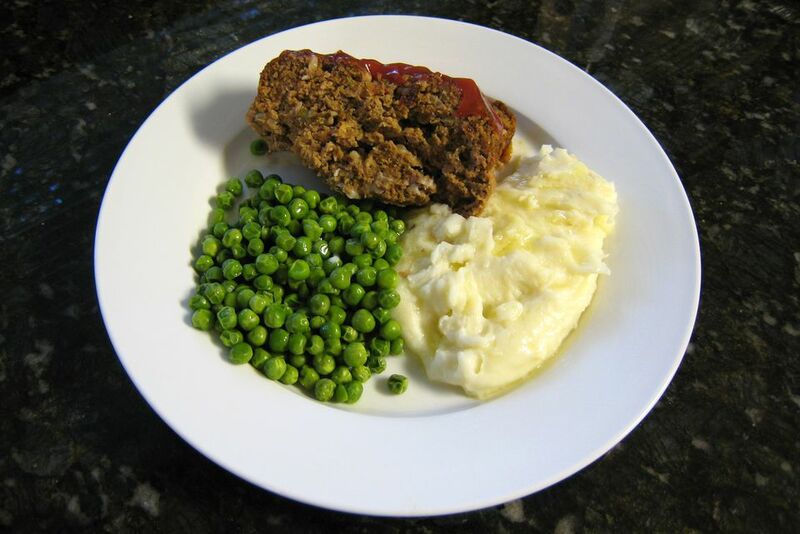 Extra-lean ground beef can produce a tough, dry meatloaf. For less mess, put disposable gloves on and mix the meatloaf ingredients with your hands. To freeze a meatloaf, bake as instructed and then drain off the grease. Cool in the pan in the refrigerator. Pull the foil pan lining up over the loaf and seal. Put the foil wrapped meatloaf in a freezer bag and freeze for up to 6 months. Leftover meatloaf? Use it in a meatloaf sandwich or crumble it and add it to marinara sauce for a quick pasta topping. Or add it to a pot of chili.